I first met Brian Greenwood as a junior cadet at the General Both as in 1952. I learned that he had previously been a student at Wynberg Boys High. From the moment I met him, I realised that he was one of the few there, who knew he was going to sea. He made one realise, there was no doubt about that. He took part in almost all of the activities possible. He was a side drummer in the band. I knew that he was a bugler as well. He was in the senior rugby team. He was in both the GB whaler and cutter crews. All this may induce readers to believe he was an innocent ‘do gooder’. No ways! He was as naughty as they come. I don’t know why, but I’m told that he was the only person who could be wrapped only in a white sheet, stare Sanderoff po faced. He was a leader amongst us even as a junior cadet. We could always trust Brian to find ways of minimising the effects on Old Salt terrorising nights. Later in life, knowing what a good leader of men, a good seaman, a good ship’s master he was. I asked him why he thought he was never made a Cadet Captain at the Bothie. He smiled, that naughty smile of his, and told me that on the day they were choosing those for promotion, he was caught by Second Officer Sanderoff, smoking in the heads!!. Brian always had a big heart for those in trouble and on their beam ends. For instance, I know that he took into his home a lady, down on her luck, together with her two children, and looked after them and their schooling for many years until they were stable again. Those friends of his who were at the memorial ceremony at the RCYC, will have heard a girl in the front row ‘heart sobbing’. She was one of those children, grown up now, whom Brian had helped in life. I know quite a lot about his very successful sea career. The Bothie must have thought well of him by sending him to Blue Funnel Line. There they were not known as cadets, but as Midshipmen. 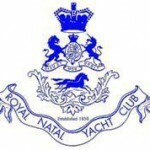 He was fourth mate in 1957 and did Second Mate’s certificate in Liverpool, First Mate’s in 1959 and after a short while ashore passed Master’s Certificate in Durban in 1965. After a further while ashore in the company’s office, he returned to sea as Master in 1969. When Brian came ashore for good, he started up a small stevedoring business which over the years grew into a sizable enterprise. Those of us who knew Brian, will not be surprised to hear that, not only was a he good business man, but he was such a good boss that he ensured the future of all his staff by making them share holders of the business. Brian eventually was able to leave his well trained crew to run the business, leaving him able to build a house in Velddrift on the river side. There he built a jetty to moor his yacht. Prior to this, he and a fine lady, Alleta had lived together in good harmony, and here on the riverside, he and Alleta lived happily for some time. Brian had so very many friends in life, yet he had the remarkable ability of making each one of us feel that we were his best friend. Admiral Peter Bitzker (Senior Cadet Capt 1953), Brian and I often enjoyed a car trip out to a Bothie mate of ours, one Danny le Roux who had hidden himself away in the sticks between Caledon and Hermanus. There we would braai, enjoy a glass of wine and Brian, to our great enjoyment, would rag Danny unmercifully about his Right Leaning politcal views. Danny, Peter and I were heart broken to hear of Brian’s passing. I will always remember Brian for his incredible general knowledge, for his excellent memory, his kind heart, and his tremendous sense of humour. Even in death, we will still remember him.